This smocking can be done using plain fabric and drawing the diagram on the fabric or you can use a symmetrical fabric print such as polka dots or any other type that lends itself to a diamond shape. Draw your dots apart as per pattern spacing dots at 1 inch intervals. Sew the texture from the right side of the fabric. 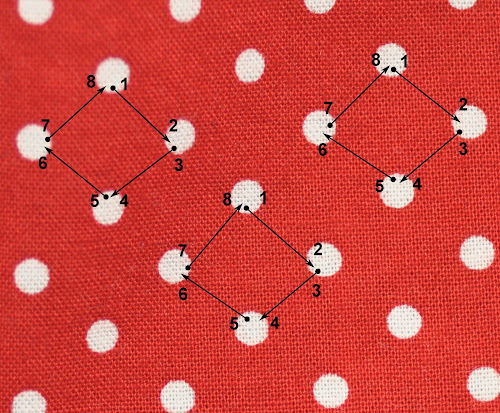 If using a polka dot pattern or a symmetrical pattern you won’t need to draw the diagram. Use the pattern itself to guide you through the stitching. Start by pushing the needle from the back of the fabric and through point 1 (see picture and diagram). Then pull the thread out and put the thread through point 2 and then come out to the top of the fabric through dot 3 and so on (see picture). On dot 8 put the needle through to the back of the fabric. See how it can be done with another symmetrical pattern. Just pick up the corner points of the pattern that will form a diamond. Do a back stitch on the back of the fabric and cut the thread. Start again with the next diamond. Measure from time to time to see when you reach 5 in x 5 in of the smocking pattern. After you have 5 in x 5 in of smocking, stretch the piece on a padded surface or ironing board using pins and steam it with your iron. Do not press. Let it dry. Square the smocking piece to 5 in x 5 in square. And the result with another pattern. 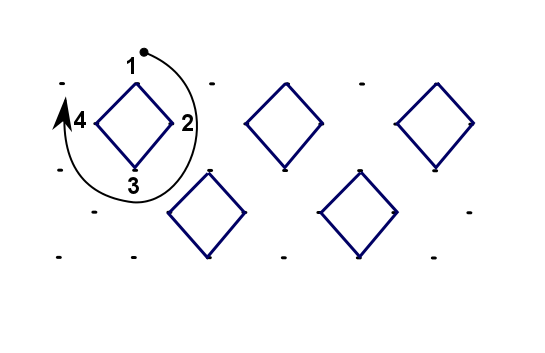 The diamonds are twice as large on the pattern below. Now cut two 5 in x 3 1/2 in rectangles and two 11 in x 3 1/2 in rectangles for the border. This is the 15th block in a series of 25 exploring texture in fabric. Oh my God! I never saw a work like this! WONDERFUL!!!!!! !